EE, the largest mobile operator in the UK and now part of BT, just announced a collaboration with Lime Micro, a leader in the next big phase of open source mobile network technology, and Canonical (Ubuntu) to ensure the UK gets better mobile coverage. EE is heavily investing in getting to 95% geographical 4G coverage by 2020. But building a big new macro tower isn’t always possible or right. They would like to use existing infrastructure like lighthouses, high-buildings, mountains, and so on. Another major problem is the coverage for remote areas which are not economically or technically viable with the current approach. This is why EE is partnering with innovators for cheaper, smaller, more resilient and better solutions. 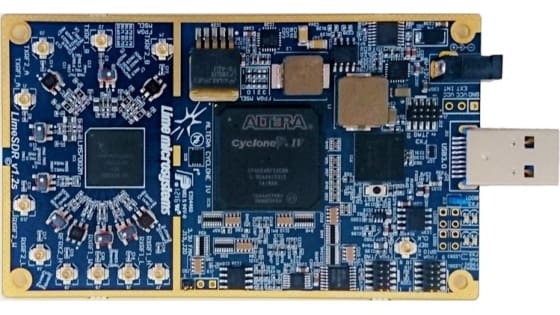 Lime Micro is about to crowdfund the first app-enabled open source software defined radio, the LimeSDR. Via a 4G app, the LimeSDR will form the basis of a fully fledged base station. Attach this base station to a balloon or a drone and you will be able to cover regions that are difficult to reach otherwise. Embed base stations inside equipment that are installed for other reasons like vending machines, cash points, smart light poles, digital signage, to name a few, and the cost of rolling out connectivity will also go down. EE expects remote communities to participate as well. These communities can have a say in the features they require and even participate in maintaining the network. This could bring communities to work with the operators in new ways and even reduce the need for trained technicians to travel long distances when you have the support of the local people – if a base station just needs rebooting, it’s not economical (or sensible) to send an engineer 300 miles from Edinburgh out to the islands. LimeSDR Crowd Supply video campaign.